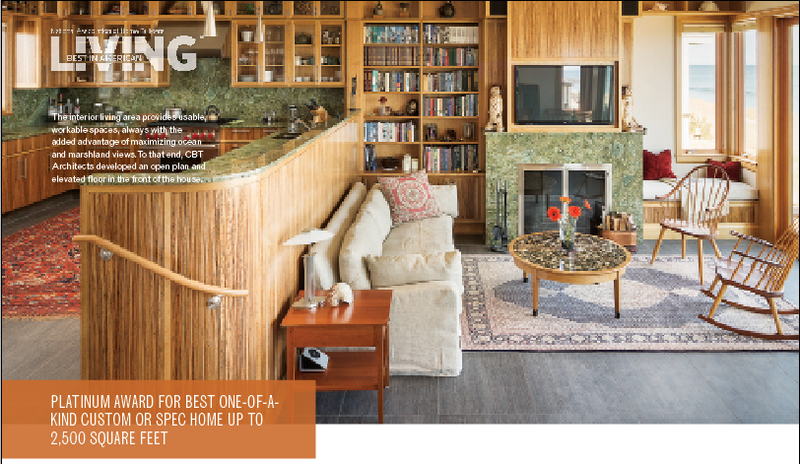 The one-of-a-kind custom and spec homes recognized in the 2015 Best in American Living Awards (BALA) program have raised the bar for custom builders everywhere. To be sure, it was no easy task picking just four homes to feature in this issue, but we believe they are the best of the best. 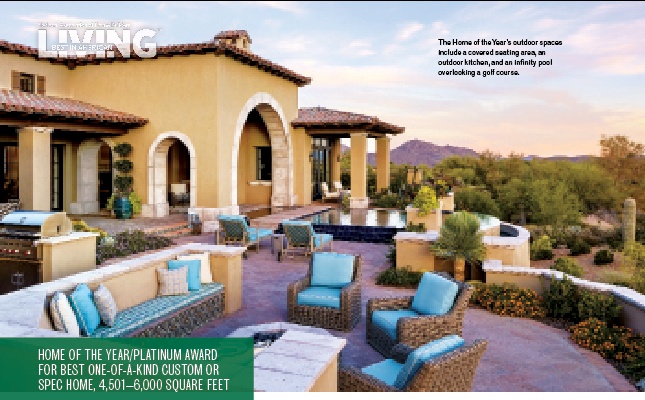 Judges freely applied such adjectives as “elegant,” “refined,” and “graceful” in their assessment of the Home of the Year, a stunning oasis in the desert. 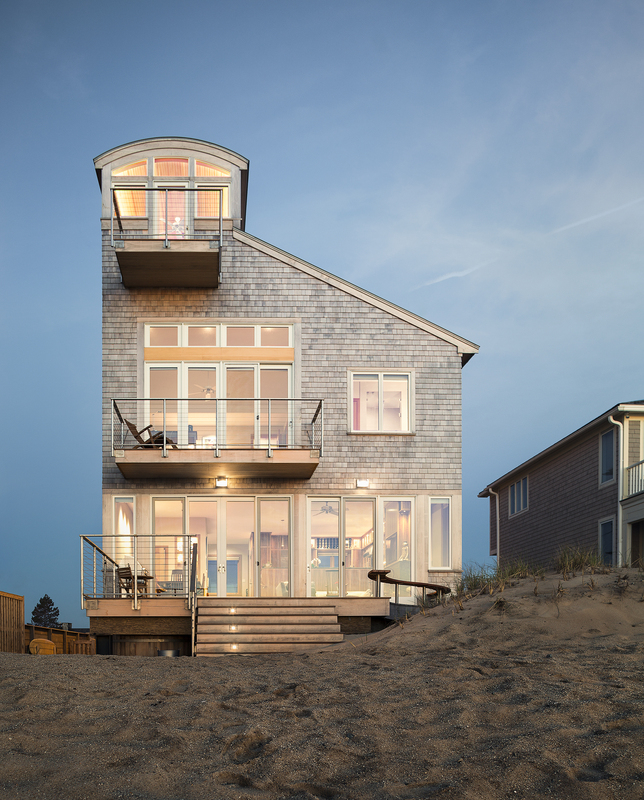 The Massachusetts beach house is modest in size but offers big views and sumptuous finishes. 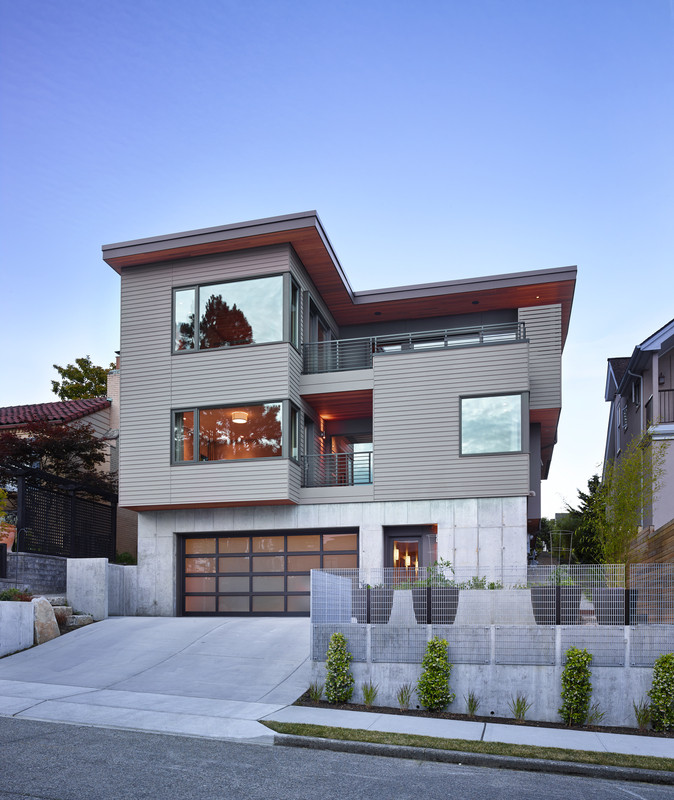 The modern, light-filled residence in Seattle was designed around the clients’ art collection and has just the right balance of public and private spaces. And the whole-house remodel in Texas respects the origins of the existing home but expands it to fit the family’s current needs. BALA is the nation’s foremost award program, continually redefining excellence in residential building. 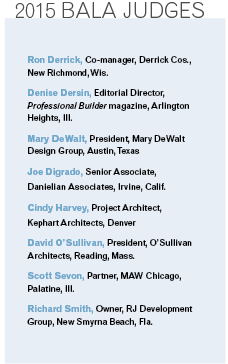 Every year, the program honors good design in single-family and multifamily homes of all types and sizes as well as communities, interior design, remodeling, and rental developments. 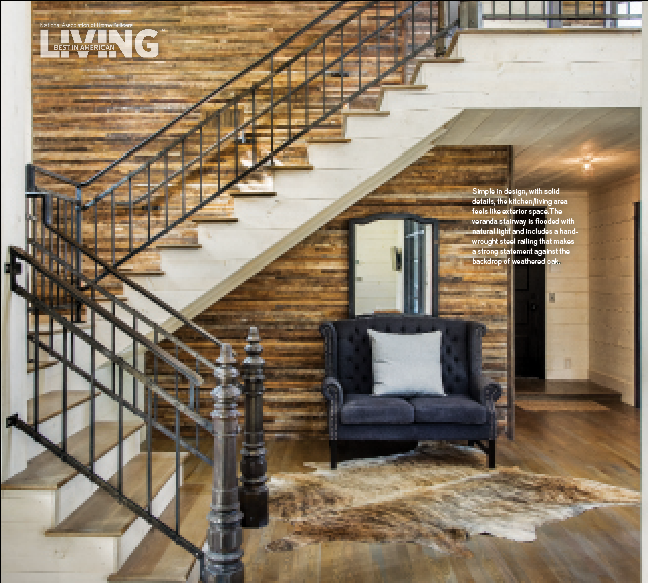 For more on the 2015 BALA winners, visit bestinamericanliving.com. Designer/Architect: PHX Architecture, Scottsdale, Ariz. The owners of this 4,916-square-foot home were ready to split their time between Arizona and Illinois and wanted to put down roots in the Southwest. Drawn to the design of Spanish-style houses, they envisioned a home inspired by a classic foundation but with an updated, neutral color palette, with layers of warmth and texture. Interior designer Kim Scodro, who is also one of the owners, collaborated with the building and design team on the single-story, hacienda-style structure, which has sweeping views and a floor plan that encourages family togetherness as well as outdoor-living opportunities that are essential to the clients. The open floor plan allows the living room, dining room, and kitchen to flow effortlessly into a central space overlooking a golf course. 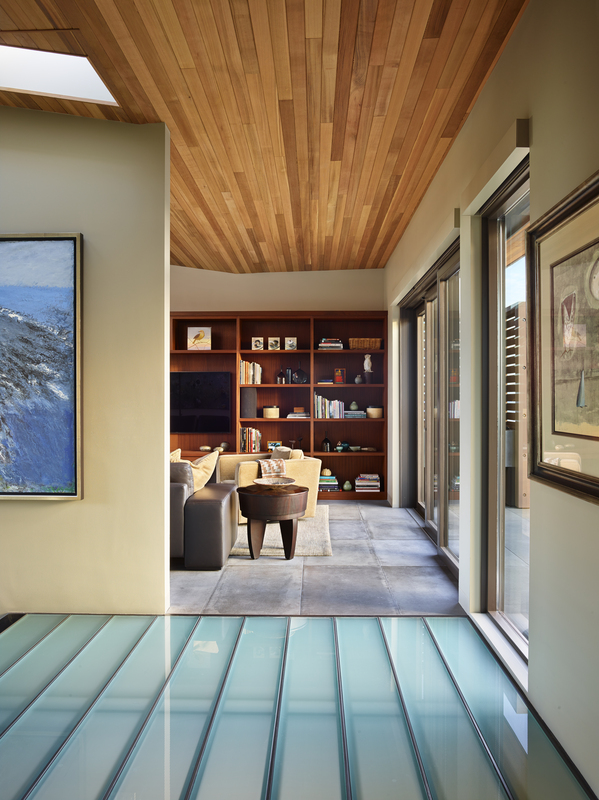 Long, adjacent hallways lead to the private quarters, while expansive glass doors seamlessly connect the interior and exterior spaces. The centerpiece of the home is an infinity-edge pool that sits on the same plane as the patio and appears to drop into the desert. When the water is still, it creates a beautiful mirror that reflects the sky. For the interiors, Scodro selected pale blues and gray sand creams to create a soft, calming palette. A matte plaster finish on the walls gives the soaring spaces a subtle depth, while wood textures lend softness and warmth. Reclaimed barnwood shelving and alder ceiling beams mirror the textured white-oak floors and 18th century Spanish doors. As her own client, Scodro was willing to take more risks, such as installing pieces of faux hide in the coffered office ceiling—a detail that took three days to complete and required almost 3,800 nailheads. The result is a comfortable, inviting home that’s open, airy, and in tune with the desert landscape, giving the family a chance to reconnect and retreat from the cold Chicago winters. 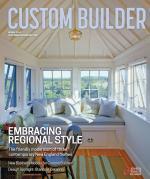 Builder: Murphy Construction, Newburyport, Mass. This 1,963-square-foot residence is located on Plum Island on a small lot near the ocean. It’s situated tightly between two other homes and enjoys commanding ocean views as well as outstanding views of the surrounding marshes and, to the west, exceptional sunsets. The form of the house reflects these views, being open on the east and west but primarily opaque on the north and south for privacy from adjacent homes. A small lookout tower on top of the house provides 360-degree views of the island and acts as a natural ventilator, pulling up and exhausting warm air from the spaces below. The home rests on pylons several feet above grade, which allows wind-blown sand to move freely underneath and to create dunes that are critical for protection from ocean storm tides. The curved waterside deck was specifically designed to shelter and protect an existing dune. Inside, floor-to-ceiling glass doors oriented to the ocean provide sweeping views of the coast from every vantage point. Corner windows reinforce the panorama. The clients selected textured green marble and zebrawood veneer to reflect the tones and hues of the dune grass and sand. Upstairs, a west-facing bedroom and study capture the softness of the marshland and the ever-changing sunsets. Cantilevered decks provide a bit of outdoor space while acting as screening buffers to the more public street façade. 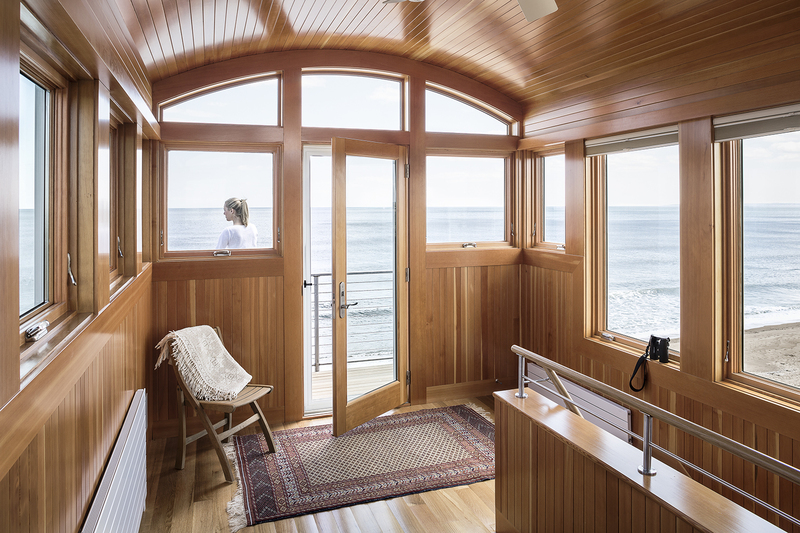 The lookout tower is clad entirely in wood from floor to ceiling and resembles a captain’s quarters. In fact, all materials were selected for their seaside qualities. Unfinished Alaskan yellow cedar shingles weather consistently to a warm gray hue in exposed and protected locations, while the zinc metal roof and stainless steel rails also will develop a patina in the harsh saltwater environment. The objective of this whole-house remodel was to fulfill the family’s need for a larger home, with the emphasis on creating an open, serene space. The challenge was to convert a cramped 1970s saltbox into an inviting residence suitable for entertaining, while respecting the original building form. Laughlin Homes & Restoration expanded the home from 1,551 square feet to 4,327 square feet with additions designed to blend in with the surrounding historical neighborhood. Accessed through a private courtyard that leads to an atrium of glass and brick, the remodeled residence retains a distinctive modern vernacular design. 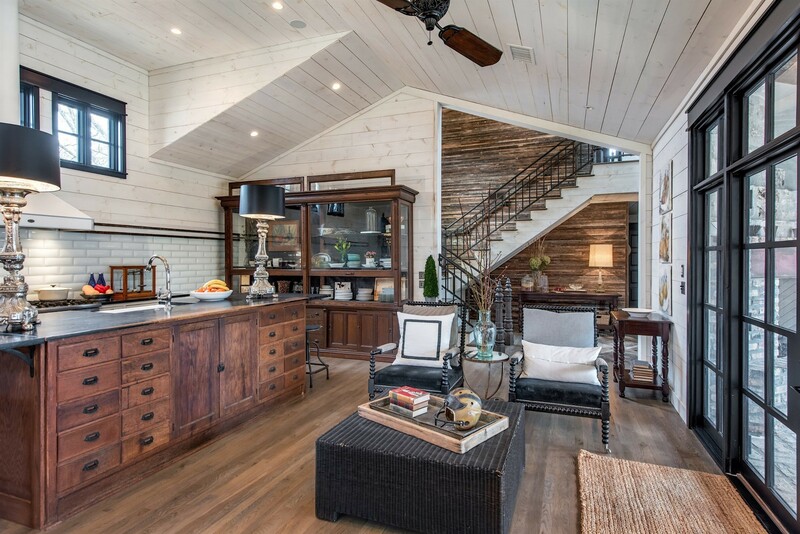 Superior craftsmanship and a clever integration of salvaged materials are hallmarks of this project. Discarded 1-inch-by-1-inch weathered oak slats were used for the interior wall siding. A salvaged cast-iron grate was inlaid into the wooden stair landing and lit from underneath to cast a beautiful pattern onto the wall at night. Solid bronze light fixtures, imported from Egypt, provide a warm look for the stairwell. Over the dining room table are two antique tornado sirens that were repurposed as lighting. The gourmet kitchen is designed around historic apothecary casework obtained from a local pharmacy. Located at the top of the veranda stairway, the master suite features a large walk-in closet, an elegant bath, and a sleeping area with a balcony that overlooks the spa and pool. Functioning interior casement windows, complete with turn-of-the-century hardware, and a custom-built door allow the master suite to open onto the balcony for an open, airy feel. The clients’ teenage daughters have their own living area and bedroom suites within the reconfigured shell of the original home. An outdoor fireplace and deep porches expand interior space into the backyard with an outdoor kitchen and poolscape. 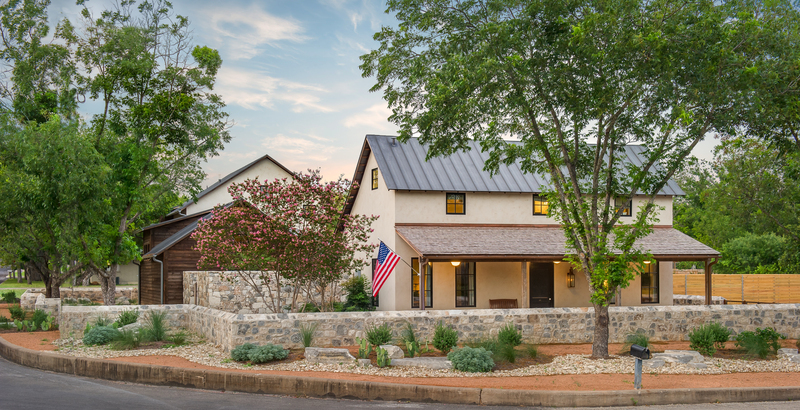 Shown after renovation, the front elevation of the home features historically-styled stone walls that provide privacy and soften trafic noise. They also provide a layering effect from the street. Interior Designer: Jan Holbrook Interior Design, Seattle, Wash.
gallery” that provides separation between public and private areas while creating numerous opportunities to encounter art in unexpected ways. The three-story home is equipped with an elevator that will enable the clients to age in place. The main living and entertaining spaces flow into outdoor areas with two distinct characters: to the west, the living and dining area opens to an expansive terrace with water and mountain views; to the east is a screened outdoor sitting area that provides shade and privacy. A glass-and-steel floor/stair structure spans the north and south sections of the house. A few steps down from the mid-level entry is the bedroom level, which features water and mountain views. The bedrooms are buffered from more public areas by alcoves for art display. The master bath has an elegantly simple layout, with refined details that combine to create a spa-like atmosphere for the space. By tucking the shower and water closet behind the vanity wall, the architect was able to keep the main space open and uncluttered. The kitchen is designed to provide an easy transition between the living, cooking, and dining areas. Sapele wood cabinets further reinforce the kitchen’s role as a warm, welcoming hub for entertaining. 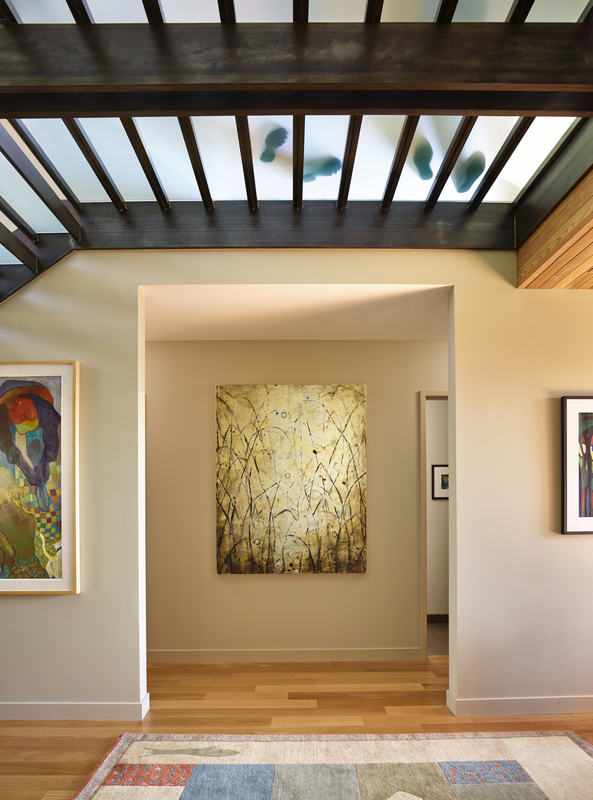 The stair landing between the kitchen and living room is made of translucent glass that glows with light from below and draws natural light from above. Comments on: "Fresh Ideas From BALA's Big Winners"